Why Is Natural Skincare Better? Thre’s no question that a natural and organic approach makes sense when it comes to choosing your food. The same can be said for other products you put on your body. Specifically, skin care. Think about all of the products you may use on a daily basis that may come in contact with your skin. Clothes, moisturizers, cleansers, fragrances, city treated water during showering, deodorant, the list goes on. 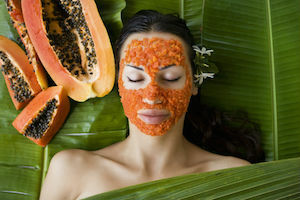 Remember, it’s not only what you eat that matters, but also what you put on your skin. Natural skin care is one of the best choices you can make for your health. As the largest organ of the body, your skin not only absorbs lots of nutrients, but it can also take in a number of toxins each day. Since your skin acts as your body’s barrier against those toxins, it’s so important to be aware of just what you’re using! If you’re putting dangerous ingredients on your skin, you can bet those are getting into your body—exactly where they don’t belong. For example, many traditional skin care products can contain endocrine-disrupting phthalates or parabens. While these poisons can cause reproductive issues, they’re also linked to increased cancer risk, and studies also suggest the more products you use, the higher toxic concentrations can get in your body. Why not look for natural or organic skincare products instead? Many of us can use up to 10 skin care products each day; that could be 10 products full of toxic chemicals! Going organic with your skin care routine will help your skin and body steer clear of those toxins—and there are other perks! A recent study suggests using natural ingredients for skin care can help treat hyperpigmentation and inflammation, while another comments on how it can help with photoaging (skin damage caused by the sun’s rays over our lifetimes). NO harmful chemicals, irritants, or preservatives. Non-allergenic and carefully formulated with all natural, organic ingredients. GMO free, never tested on animals, and made in the USA. Isn’t it time to try something better for your skin and your health? After all, it’s our mission to bring back good health, positive thinking, happiness, and love, and we think using products like Rolling Meadows Naturals Goats Milk Soap, Body Butter, Lotions, Colloidal Oatmeal, and Lotion Sticks, can help you reach that goal. †Results may vary. Information and statements made are for education purposes and are not intended to replace the advice of your doctor. Rolling Meadows Naturals does not dispense medical advice, prescribe, or diagnose illness. The views and nutritional advice expressed by Global Healing Center are not intended to be a substitute for conventional medical service. If you have a severe medical condition or health concern, see your physician.